Chelsea returned to the top of the Premier League with victory over Stoke after an inspiring performance by Mohamed Salah. On his first Premier League start, the Egypt forward gave the hosts the lead when he swept in Nemanja Matic's cut-back before the break. The £11m signing was tripped by Andy Wilkinson for a penalty which Frank Lampard scored at a second attempt. Willian curled in a third to open up a one-point lead over Liverpool. After consecutive defeats by Crystal Palace and Paris St-Germain, victory restored confidence to Jose Mourinho's side and their supporters ahead of the second leg of their Champions League quarter-final at Stamford Bridge on Tuesday. The Portuguese boss must wish he had the impressive Salah at his disposal, but the former Basle player is cup-tied after playing in the competition already this season. Chelsea now have a two-point advantage over third-placed Manchester City, who have played two games fewer, but Liverpool can return to the summit if they avoid defeat in their game in hand at West Ham on Sunday. Despite easily ending Stoke's run of three successive wins, Mourinho still cut a miserable figure on the sidelines after criticising his side following their 3-1 Champions League loss in Paris. Fernando Torres - left out against PSG - was included against Stoke, yet he still looked short of the "real striker" Mourinho said he was looking for. Spaniard Torres dragged an early shot wide and failed to beat Asmir Begovic from close range when Erik Pieters made a hash of a chest back to the Stoke goalkeeper. Fortunately for the Blues, though, Salah grew in influence as Chelsea began to dominate the game. With their usual match-winner Eden Hazard rested, 21-year-old Salah looked sharp as he cut in from the right, and took his goal superbly after 32 minutes. Matic, back in the side after being cup-tied in the Champions League, carried the ball to the left byline and pulled it back to the edge of the area for Salah to slam in. Branislav Ivanovic was a marauding influence down the right, often going past Salah, and twice tried his luck before a header was ruled out for offside. Although Stoke have impressed recently as they chase their best top-flight finish, they offered little, with Peter Odemwingie's early shot a rare attempt at goal. Stoke boss Mark Hughes introduced Charlie Adam at the break but, having just returned from suspension, the midfielder's first meaningful act was to tread on Andre Schurrle's foot. The German was later replaced by Hazard, who took less than two minutes to make his mark as he combined with Salah to earn a penalty. Half-time substitute Wilkinson could have no complaint when he hacked down Salah, with Lampard scoring after Begovic saved his low spot-kick for his 250th career goal. Stoke rued a great chance to claw a goal back when Marko Arnautovic failed to control Steven N'Zonzi's through ball. As the game petered out, Willian scored a fine goal as he surged to the edge of the box and found the net from 18 yards. Stoke boss Mark Hughes: "We found it really difficult to retain possession high up the park and we didn't have a foothold in game. "You need players playing to their maximum when you come to Stamford Bridge, but we didn't have the number that we needed to cause Chelsea problems." 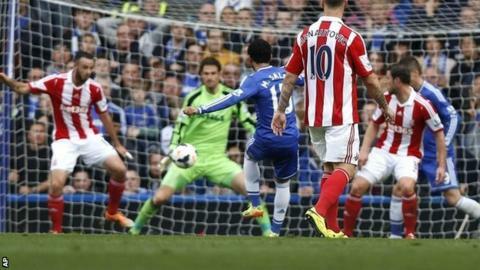 Match ends, Chelsea 3, Stoke City 0. Second Half ends, Chelsea 3, Stoke City 0. Attempt missed. Charlie Adam (Stoke City) left footed shot from outside the box is close, but misses to the right. Assisted by Steven N'Zonzi. Substitution, Chelsea. Ashley Cole replaces Willian. Dangerous play by Charlie Adam (Stoke City). Foul by Andy Wilkinson (Stoke City). Goal! Chelsea 3, Stoke City 0. Willian (Chelsea) right footed shot from outside the box to the bottom right corner. Assisted by Mohamed Salah. Substitution, Chelsea. David Luiz replaces Frank Lampard. Corner, Stoke City. Conceded by John Terry. Attempt blocked. Peter Odemwingie (Stoke City) left footed shot from outside the box is blocked. Assisted by Ryan Shawcross. Attempt saved. Charlie Adam (Stoke City) left footed shot from outside the box is saved in the bottom right corner. Assisted by Peter Odemwingie. Corner, Stoke City. Conceded by Nemanja Matic. Foul by Frank Lampard (Chelsea). Attempt missed. Frank Lampard (Chelsea) right footed shot from more than 40 yards on the right wing is close, but misses to the right from a direct free kick. Mohamed Salah (Chelsea) wins a free kick on the right wing. Attempt missed. Eden Hazard (Chelsea) right footed shot from the left side of the box is high and wide to the right. Assisted by Nemanja Matic. Corner, Chelsea. Conceded by Marc Wilson. Attempt missed. Fernando Torres (Chelsea) right footed shot from a difficult angle on the right misses to the left. Assisted by Willian. Goal! Chelsea 2, Stoke City 0. Frank Lampard (Chelsea) right footed shot from very close range to the centre of the goal. Penalty saved! Frank Lampard (Chelsea) fails to capitalise on this great opportunity, right footed shot saved in the bottom left corner. Penalty Chelsea. Mohamed Salah draws a foul in the penalty area. Penalty conceded by Andy Wilkinson (Stoke City) after a foul in the penalty area. Substitution, Chelsea. Eden Hazard replaces André Schürrle.